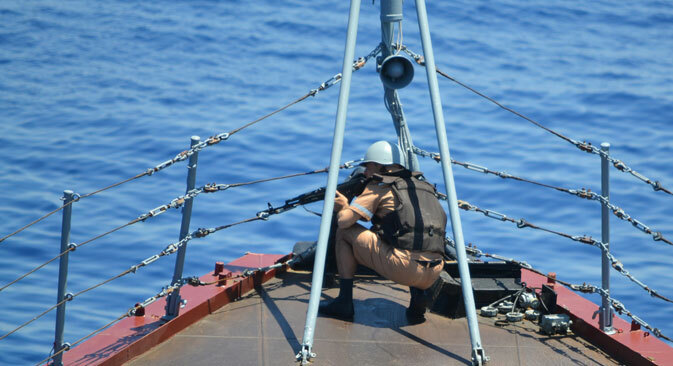 The Russian and Chinese navies recently held their first joint exercise in the Mediterranean Sea. According to naval representatives from both countries, the Sea Cooperation-2015 drill has shown that Russia and China are ready to jointly respond to threats at sea, even if such threats emanate a long distance away from their naval bases. Significantly, the Russian missile cruiser Moskva’s home port Sevastopol was used as the main headquarters of the exercise. Russia has in effect declared its readiness to use the Crimean city as a stronghold for its military presence in the Black and the Mediterranean seas. Western analysts point out that since last year, when Russia’s relations with the USA and its European allies considerably deteriorated, Moscow has been staging an increasing number of military exercises and snap checks of combat readiness. The Russian side traditionally cites the need to defend its interests given NATO’s growing activity at its borders. Overall, drills like these show to the West that Russia is capable of defending its interests outside its national territory and securing support from its allies. Mediterranean Sea. In 2011, The Chinese Navy evacuated 30,000 Chinese workers from Libya. The exercise, which did not involve that many ships or personnel and did not have any extraordinary tasks, is far less significant than the message it sent to the West. Russia and China wanted to let the world know that Europe is a zone of responsibility not just for NATO. At the same time, the threat lies not in Sino-Russian cooperation but in how it is interpreted by the USA and its allies, which tend to justify their own expansionist policy and practice of “humanitarian intervention” by the presence of an outside enemy. Today one can confidently maintain that neither Russia nor China harbor any plans to attack the USA or its allies and that one of the main goals of increasing their defense capability is to prevent unwanted military activity, including blatant acts of provocation, near their borders.